The sauerkraut fermentation has long been the subject of interest among food microbiologists as well as microbial ecologists. In fact, many of the biochemical and microbiological details of the sauerkraut fermentation were described as long ago as the 1930s. This interest has undoubtedly been due, in large part, to the very nature of the fermentation process, in that it involves several different naturally-occurring microorganisms acting as part of a complex ecosystem. Recent reports suggest that bacte-riophages may also play an important role in the microbial ecology of the sauerkraut fermentation (Box 7-1). The manufacture of sauerkraut and many other fermented vegetables depends on a succession of organisms that are naturally present in the raw material. Some appear early on in the fermentation, perform a particular function, and then, for all practical purposes, disappear from the product. Other organisms, in contrast, emerge later in the fermentation and then remain at moderate to high levels throughout the duration of the fermentation and post-fermentation process. However, growth of those organisms that occur late in the process depends on those organisms that had grown earlier and that had established the correct environmental conditions. Microbial activity begins as soon as a brine has formed. Initially, the atmosphere is aerobic, with redox potentials (or Eh values) of over 200 mV However, the combined effects of physical exclusion of air and residual respira tion and oxygen consumption by plant cells quickly reduce the Eh and make the environment anaerobic. Thus, pseudomonads, fungi, and other obligate aerobic microorganisms that may initially be present at high levels, have little opportunity for growth. Some of these organisms are also salt-sensitive, further reducing their ability to grow in this environment. Still, at the temperatures used during the sauerkraut fermentation (20°C to 25 °C), many other indigenous salt-tolerant, mesophilic, facultative organisms might be expected to grow, including Enterobacter, E. coli, Erwinia, and other coliforms. Instead, these organisms persist for only a short time, perhaps as little as a few hours, due to competition by lactic acid bacteria and the inhibitory effects of the acids produced by these bacteria. The lactic fermentation in sauerkraut occurs in a series of overlapping stages or sequences. These stages and the succession of microorganisms associated with each stage have been very well studied. Remarkably, the fermentation almost always follows the exact same pattern (Figure 7-2). The first stage, variously referred to as the initiation or heterolactic or gaseous phase, is marked by growth of Leuconostoc mesen-teroides.This organism is salt-tolerant and has a relatively short lag phase and high growth rate at low temperatures (15°C to 18°C). Importantly, it metabolizes sugars via the heterofer-mentative pathway, yielding lactic and acetic acids, CO2, and ethanol. The acidic environment (0.6% to 0.8%, as lactic acid) created by growth of L. mesenteroides not only inhibits non-lactic competitors, but it also favors other lactic acid bacteria.The production of CO2 also contributes to making the environment even more anaerobic (as low as —200 mV), which again favors the more anaerobic lactic acid bacteria. Eventually, however, as the acid concentration approaches 1.0%, L. mesenteroides is, itself, inhibited, and within four to six days, this organism is barely detectable. To microbial ecologists, there are few model systems better suited for the study of microbial interactions than that which occurs during the manufacture of sauerkraut and other fermented vegetables. Consider what transpires in the course of a typical vegetable fermentation.There are, for example, major shifts in the environment, from aerobic to anaerobic, and from a neutral to acidic pH. The availability of nutrients, and fermentable carbohydrates, in particular, decreases during the fermentation.At the same time,there is a succession of microorganisms, such that some species, present at the outset, are displaced by other microbial communities, and cannot even be detected at later stages. In addition to these environmental and extrinsic factors, bacteriophages have recently been recognized as having a major influence on the microbial ecology and diversity of fermented vegetables (Lu et al., 2003 and Yoon et al., 2002). 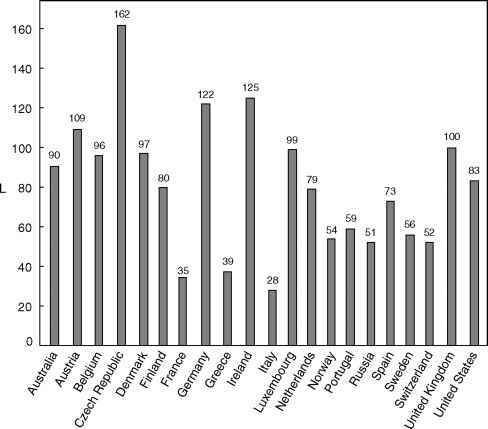 Phages, it now appears from these studies, are widespread in commercial sauerkraut fermentations and may directly influence microbiological succession during the fermentation. Over a two-year period, these investigators isolated more than twenty-six distinct phage types that were capable of infecting lactic acid bacteria, including species of Leuconostoc, Lactobacillus, and Weissella sp. 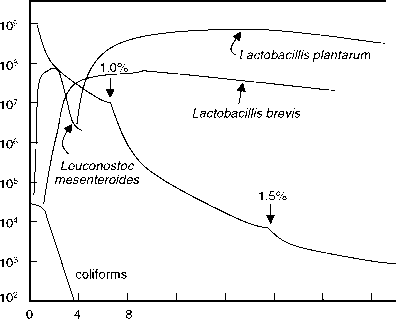 Importantly, the appearance of some members of the natural microflora was correlated with the appearance of their homologous phages.That is, phages capable of infecting Leuconostoc were only isolated during the first few days of the fermentation, when the flora are dominated by Leuconostoc. Phages that infect Lactobacillus, in contrast, were not found until later in the fermentation, when Lactobacillus plantarum and other species had become established.Thus, these phage infection events coincided with the main population shift that occurs during the sauerkraut fermentation, from mainly heterofermentative species to mainly homofermentative species. Further characterization of these phages revealed that some were stable in low pH environments (pH 3.5) and were capable of persisting in the tanks for as long as sixty days. It appears from this work, therefore, that the well-studied phenomenon of succession that occurs during the sauerkraut fermentation may be mediated not just by the changing environment, but also by the emergence of bacteriophages. There is another very practical reason why bacteriophages are important in vegetable fermentations. Although many manufacturers still rely on natural fermentations to produce these products, starter cultures are now being used more frequently in pickle production, and applications for their use in the manufacture of other fermented vegetables is expected to increase. However, like most industrial fermentation processes in which pure culture strains are used on a repeated basis, infective bacteriophages will invariably emerge. If the phage population in a pickle production environment, for example, was able to reach some critical level, infection and lysis of starter culture strains may occur to the point at which the fermentation fails. Because cucumbers (and other raw materials used in fermented vegetable manufacture) cannot be heated, nor are these fermentations conducted under aseptic conditions, it is not possible to exclude phages from the production environment.Thus, the continuous use of starter cultures in large-scale manufacture of pickles and other fermented vegetables may provide ideal conditions for phage proliferation.Although there are no reports of phage problems in this industry, it has been suggested that development of phage control systems may still be warranted. mentations.Appl. Environ. Microbiol. 69:3192-3202. Yoon, S.S., R. Barrangou-Poueys, F. Breidt, Jr.,T.R. Klaenhammer, and H.P. Fleming. 2002. Isolation and characterization of bacteriophages from fermenting sauerkraut.Appl. Environ. Microbiol. 68:973-976.